Tiger Woods shoots a 4-under 68 and is five shots behind in his competitive return. 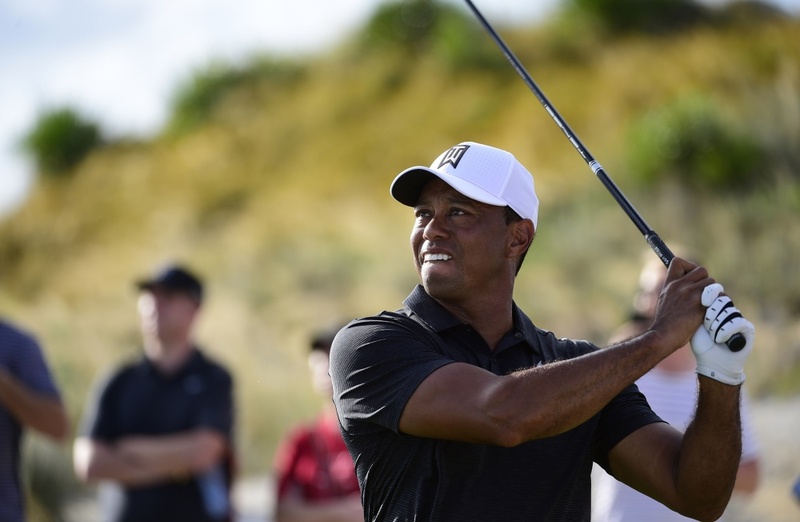 In another impressive showing in his latest comeback from back surgeries, Woods built on a solid start with a 31 on the front nine at Albany Golf Club that briefly gave him the lead Friday. He stalled on the back nine with a pair of bogeys and not enough birdie chances, and settled for a 4-under 68. Hoffman made 12 birdies, closing with five straight. He was at 12-under 132 and had a three-shot lead over Jordan Spieth (67) and Tommy Fleetwood (69). Hoffman made only one par over his final 12 holes to go with eight birdies and three bogeys. But this week a holiday exhibition with an 18-man field and no cut is all about Woods. That much was obvious after the round. He made the 20-foot putt to reach 8 under. Behind him, Hoffman made bogey on the par-3 eighth. Woods was alone in the lead, and the workers at the white scoreboard to the left of the green quickly moved his name to the top as some 100 people – that constitutes a large gallery this week – began cheering. There was a smattering of “He’s back!” and even a few mentions about the Masters. He had played only seven rounds dating to August 2015. EUROPEAN: Marc Leishman took advantage of an early start to shoot a 7-under 65 and move into a share of the second-round lead with Adam Bland at the Australian PGA Championship in Gold Coast, Australia. Masters champion Sergio Garcia was six strokes behind after a 71 while Adam Scott missed the cut by two shots after bogeying 4 of 6 holes on the back nine at Royal Pines and shooting 74. • Arjun Atwal held on for a one-shot lead after two rounds of the Mauritius Open in Bel Ombre, Mauritius.